Find and get rid of all the viruses and malware in your computer. 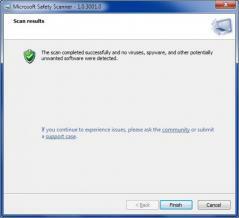 Microsoft Safety Scanner works perfectly along your existing anti-virus and scans your computer in order to find all the spyware, viruses and other threats in the system. It is a very useful security program that runs on-demand and removes all the above mentioned threats. It is important to know that this is not a replacement for your anti-virus software. This program works only on-demand so you also need a software program that provides continuous protection to your computer. You can also download Microsoft Security Essentials if you need a program to protect your PC from viruses, spyware and malware in real-time. Remember: Your Microsoft Safety Scanner expires after 10 days from the date when it was downloaded. If you want to run this program again just re-download it and you’ll get an updated version ready to protect your computer against the latest threats. -You need 200MB available space on your hard disk.